The Syracuse University Pride basket was created for the students and alumni of SU. This basket features 10-12 pieces of Extra Fancy US #1 fruit (mainly citrus), fresh NY State apple cider (depending on season), Lindt Orange Creme chocolate and Dark Truffles, gourmet chocolate covered blueberries, Route 11 Chips, gourmet peanuts and pretzels. 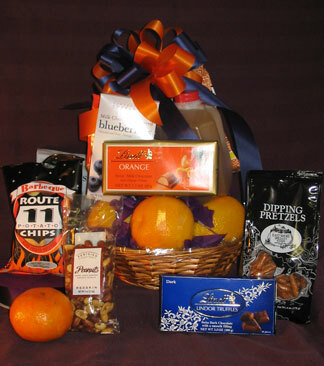 The basket is wrapped tightly and topped off with a special handmade Orange and Blue bow. Hoorah for SU. Makes a great gift for any occasion... especially for finals week or for GAMEDAY! note: Bennett's Baskets is not affiliated with Syracuse University.